You will fly over one of the major wine regions in Ontario. 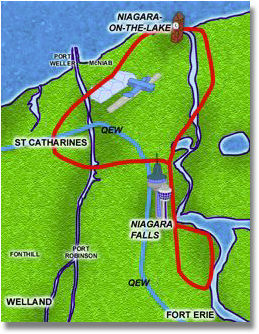 Nestled between the shore of Lake Ontario and the Niagara escarpment, this area has a unique microclimate which moderates both the summer heat and winter cold and has the ideal combination of sandy loam, gravel and clay soils to provide proper drainage and acidity to grow the vitis vinifera vines necessary to produce world class wines. Niagara's vineyards are situated along the 43 parallel similar to the famous wine regions of France, Italy, California and Spain. Over 14,000 acres are cultivated to supply juice for the 48 wineries located here. Your flight will take you over historic Niagara on the Lake where you will not only see the hundreds of sail boats and the mouth of the Niagara River but you will also be taken back in time with the historic forts that once defended the border. Fort Niagara, located on the American side of the Niagara River was originally constructed in the 1680's by the French as a fur trading post and was later taken over by the United States during the American Revolution. The British then constructed another fortification to protect its territory on the west bank of the river. As the flight continues, you will see two small lakes which are man made reservoirs which store water for the hydro electric generating stations. Water is diverted from above the falls through underground tunnels and canals to turn the giant turbines which producing electricity. Harnessing the power of Niagara began near the turn of the century which and fostered the tremendous industrial growth and chemical production primarily in New York State. The Welland Canal was first built in 1824 to allow ship passage between lakes Erie and Ontario and to bypassing Niagara Falls. Four canals have been constructed since the first one to allow millions of tons of cargo to pass through the canal each year from cities such as Detroit or Chicago destined for the Atlantic ocean and ports around the world. From the aircraft window you will be able to follow the rout of the canal and see the various locks along its route. Niagara Falls, truly one of Nature's wonders, is a cascading waterfall over 54 metres high with some 170 million cubic metres of water thundering into the gorge every minute. 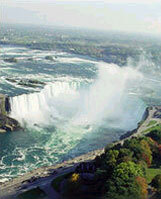 This spectacular view is also the most breathtaking and scenic segment of your aerial tour of Niagara. Niagara, a North American Indian name meaning thundering waters was formed 12,000 years ago as the glaciers retreated during the last ice age. Today, more than 14 million visitors come to see the falls each year. Bring your camera. You won't want to miss the wonderful photo opportunities and memories to last a lifetime.